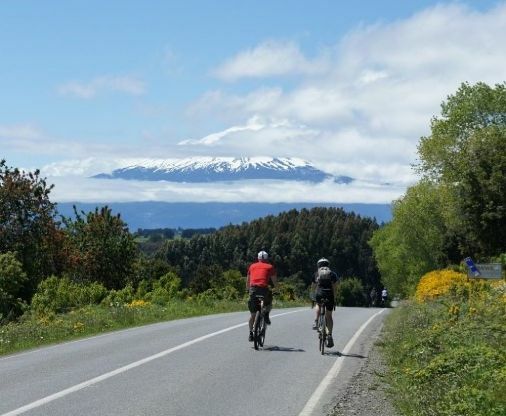 A journey through one of the most magnificent landscapes in the world from Puerto Montt to Temuco. The ever-changing Patagonian scenery, shaped by millions of years of volcanic activity, is rich with outstanding natural beauty: smouldering volcanoes, snow-capped mountains and towering granite peaks. The lower slopes of the Andes are blanketed with ancient rainforest and lush vegetation and deep valleys are filled with icy fjords, emerald lakes and tumbling waterfalls. Encompassing some of the most awe-inspiring and contrasting panoramas in South America what better vantage point to enjoy Patagonia than the saddle of a bicycle?